I want ice cream. That is one cute husband. Lucky him and you. Sorry so shallow ! Yes, lucky us, for true. And yes, he IS cute. It’s not shallow to state the obvious…..
Hmm, they certainly don’t splurge on the bars of soap over there, do they. P.S. I think Mark is cute too, and you pretty. It’s not the size of the soap, Lynn… it’s that it says “welcome to Montengro”! ha ha, we’re in a completely different country. 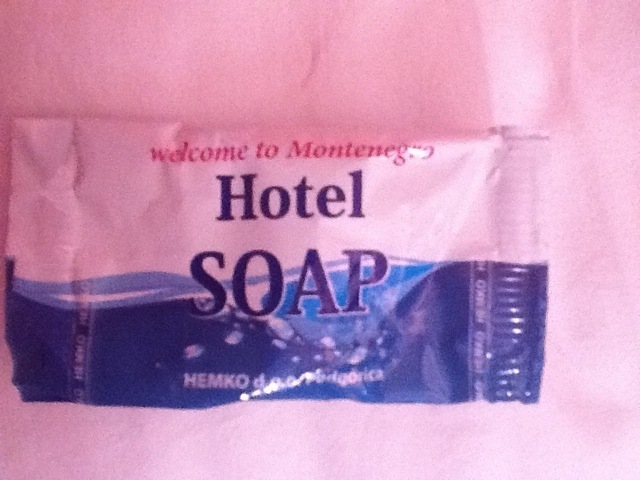 I’m hoping that the soap in Montenegro says “Welcome to Bulgaria” or something….